You will need to Python 2, PyGTK, and python bindings of either gtksourceview or gtksourceview2. 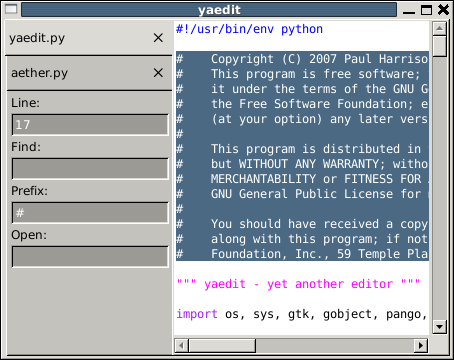 yaedit is my rather minimal programmer's editor, based on gtkSourceView. It's been designed to suit my development style, which involves very rapid iterations. My preferred "IDE" is yaedit and a tabbed Gnome terminal window. Anything more is too cluttered. Save. Every edit is saved immediately. Changes to the file by other programs are loaded automatically. An option to set the bloody tab size and screw up your indenting. Tabs are 8 spaces, get over it. In fact, does not have any dialog boxes. Menus or ugly icons that take up precious screen real-estate. Auto-insert boilerplate text. If you find yourself needing this feature, then have a nickel kid, go get yourself a real language. Editable current line number display. Selection prefix editing to easily indent, unindent, comment out blocks. This editor is my testbed for UI idioms that have both the learnability of GUI and the efficiency of older idioms.